EXIF Data stands for Exchangeable Image File to set information such as static information and dynamic information which can be used to study photography. We talked about the theoretical part on EXIF Data in Digital Photography in our previous article, in this article we will go through the practical usage of EXIF Data. What EXIF ? ?Data is Useful ? Dynamic information, which changes from pictures in to picture, such as the values ? ?used for aperture, shutter speed and ISO or the date on which the photo was taken. EXIF data are recorded with each shot and embedded in the image. Knowing the EXIF ? ?data of your shots will not change your life but may be helpful in some cases. Especially when we still do not have a lot of experience as photographers, we may not be able to identify what elements of a picture making it looking better or worse than the other. So, for example you have chosen a better focal length unconsciously. In this case, viewing the EXIF ? ?data, the insight is that in that picture – we used a focal length much greater than other photos with subjects like that can make us understand that that was the element that made the photo more beautiful, more effective. Some tools for sharing photos online allow you to view EXIF data of the shared photos. Thus, we can spy on some of the settings used by photographers that we like and take it from this example as inspiration. There are several programs (such as Adobe Photoshop) that provide some info to the Operating System’s search engines that allow us to search through our photos based on their EXIF ??data. For example, all pictures taken with the flash or all photos with a given resolution or all pictures for which it was used a certain value of ISO and so on. How to find and view the EXIF ??Data? Is there really a plethora of ways for you to view EXIF ??data. In the easiest way is through the properties / information option that comes on the right click on an image file – on OS X, Windows or standard Linux distro. From there we can choose the option and we will find one that lists all the EXIF data. 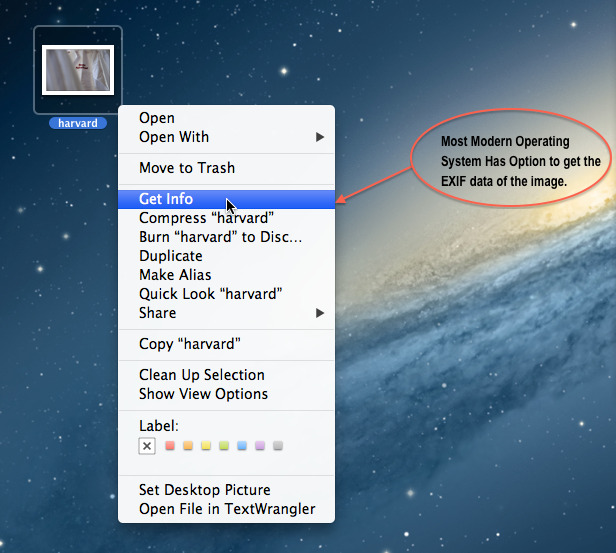 All paid programs for image processing have some menu item that allows you to access the EXIF data. Unfortunately the name of the menu item will change depending on the program. Cite this article as: Abhishek Ghosh, "EXIF Data : How to Use EXIF Data for Self Improvement," in The Customize Windows, May 11, 2013, April 26, 2019, https://thecustomizewindows.com/2013/05/exif-data-how-to-use-exif-data-for-self-improvement/.